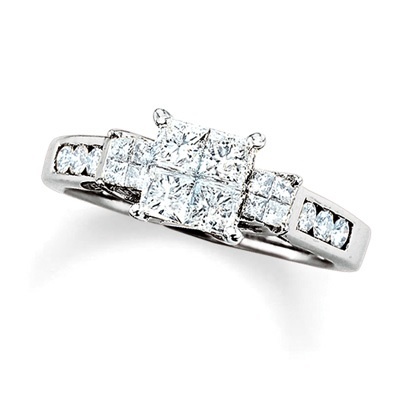 This 14K white gold ring's massively beautiful princess-cut center stone holds a secret: designed to appear as a single stone, four smaller princess-cut diamonds come together seamlessly to form a quad center stone. Two sidestones reveal the same technique, allowing the ring to display all the brilliance of larger stones. Round diamond accents within the shank further brighten the ring, bringing the total weight to a beautiful 1 ct. PRODUCT SPECIFICATIONS Stone Type Diamond Stone Shape Princess Diamond Total Weight (CT. T.W.) 1 Diamond Color H - I Diamond Clarity I2 Stone Setting Invisible Gold Karat 14K Standard Ring Size 7 Lifetime Diamond Commitment Yes Metal Color White Metal Type Gold Stone Color White Diamond carat weights (CT.) represent the approximate total weight (T.W.) of all diamonds in each setting and may vary no more than .07 below the stated weight. Typographic errors are subject to correction. Merchandise enlarged to show detail and may not always be exactly as pictured. Promotions, prices, styles and availability may vary by store and online.